Welcome to Prince Andrew's Castle, a 5 bedroom, 5 bathroom luxury home with private pool and spa in the exclusive 5 star gated resort of Windsor Hills. Just 2 mils from the gate of Walt Disney World! Our home features top notch electronic entertainment systems (52' LCD HDTV, Nintendo Wii and WIFI High-Speed Internet connection and Desktop PC). Game Room feature pro-grade air hockey table and pool table and Kids' train table. We also own properties with Home Away ID 237627 and 346287 and 346571 and 3539393. We have many many reviews on our properties. We have been providing reliable, honest and trustworthy services to our guests for the past 6+ years. 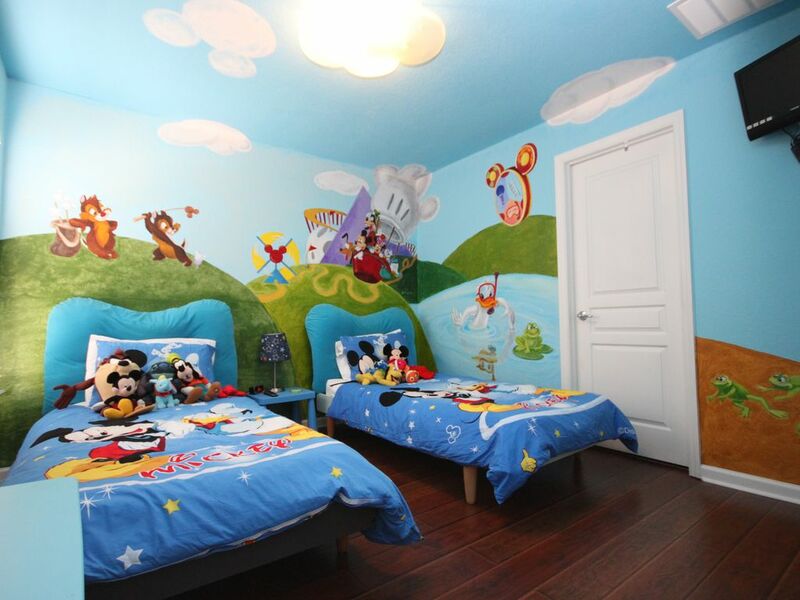 Mickey Room features wall mural hand painted by professional artist. Your little princess will love our Princess room with Disney collection princess furniture. Maple cabinets with black granite countertops in the kitchen, stainless steel top of the line appliances and the very best in luxury high end furniture through out the house. On the first floor, there are 2 king master suites with 32' LCD TV/DVD. A guest suite with queen bed is also located on the first floor with 26' LCD TV/DVD. Your kids will love our specially decorated theme rooms upstairs. Your girls will truly be princesses in our princess room. Our Mickey room is professional decorated with large wall murals of Mickey and friends. This is truly a magical castle for your prince and princess. Both princess and Mickey room have LCD TV/DVD. All bedrooms have their private bath. Our Air Conditioning Game room will be enjoyed by both adult and children. Pool table, commercial grade full size air hockey table and a Children's play area with wooden train table and tool bench. Large TV with DVD/VHS player and Nintendo Wii for all to enjoy. Located at the Reserve, the upscale part of the Windsor Hills resort, 'Prince Andrew's Castle' has a premium lot that over looks a natural area, not into another home or pool. The higher elevation of the Reserve makes for a wonderful view of the surrounding community and fireworks! One of the three children's playgrounds is within 1-2 minutes walk from the back of the house. Windsor Hills is a gated resort with 24-hour security. The resort includes a 10,000 sq. ft. Clubhouse with a huge lagoon-style pool complete with a water slide and hot tub; a toddler pool; state of the art fitness center; 40-seat high definition theater; video arcade; and billiards; and a computer lounge with full internet access. In addition, within Windsor Hills, there is a large Castle Playground; small playgrounds throughout; sand volleyball and tennis courts; a putting green; an RV parking area; and an on-site sundry store. All of this is free of use for you and your guests staying within the Windsor Hills resort. Windsor Hills resort has all the amenities of a five-star hotel/resort, but with the comfort, convenience and privacy of a private home. Our local management company will ensure that the home is ready for your arrival and respond to any needs that may arise during your stay. Please come and enjoy a truly magical and relaxing vacation at Prince Andrew's Castle! We provide high chair, booster seat, crib, pack&play, bed rails, two strollers and stairs gates. Home was just as advertised. Pool and hot tub were perfect! Owner is great to work with, so helpful! I loved the extra items provided like kids toys and strollers. We had everything needed for an awesome Disney experience. This was a trip to take the grandchildren to the Disney parks for the first time. When the grandchildren walked into their themed bedrooms the "magic" began! This 5 bedroom 5 bath house was perfect for us. The children loved the pool and play room although we never did figure out how to turn on the air in the playroom. They also really loved the community pool and water slides. I wish we would have had one full day at the community pool because they loved it so much. Sometimes it's not all about the parks! We love the close proximity to the parks and especially to Walmart. Recommend going to Walmart for Disney shopping before paying the park prices. They have a tremendous Disney section. Thank you for such awesome accommodations. This property had everything we needed for our family of 5 adults and 2 children and it's close to the Disney Parks (15 to 20 minutes). House was clean, spacious and well equipped for preparing meals. Kids loved the private pool as well as the gated community's water park with it's 2 water slides, large pool and a splash pad! There's a 24 hour Walmart 3 minutes up the road as well as lots of chain restaurants nearby. Only negative was that the quantity of cleaning supplies on hand was really inadequate, a situation that the owner promised to address for future guests. Great house. Great location. Great owner. Loved the dual master bedroom on first floor. It was really nice that EVERY bedroom had a full bath attached. Would definitely stay again and recommend! Windsor Hills Resort is the best 5 star resort and 2 miles to Disney, lots of restaurant and shopping within 1 mile of the Resort.